The Jackstock show at the 1904 St. Louis World’s included classes for both jacks and jennets. There were twenty-seven different sections making it one of the more popular displays at the fair. A large class of Jacks in the Livestock Forum. 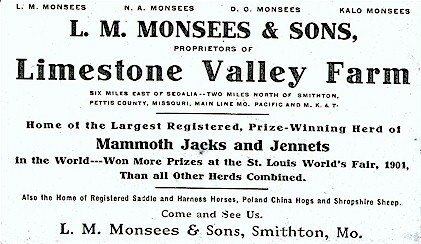 The most famous display of jacks came from Missouri's Limestone Valley Farm of L. M. Monsees and Sons. Mr. Monsees and Sons had been stock breeders for a quarter of a century and had shipped high-grade jacks to almost every state at that time. Their winning ways continued at the World's Fair where they won the major prizes. They brought their Missouri-bred grand champion jack, Orphan Boy. Orphan Boy, became more universally recognized when he was placed first in all classes he was entered in at the World’s Fair. Jack-Three years and under four: Emerson Pride; Exhibitor L. W. Emerson, Green, MO. Jack and four Jennets- All three years old or over, bred by exhibitor: Limestone Duplex; Exhibitor Limestone Valley Farm, Smithton, MO. The undefeated and grand champion show jack of the world. 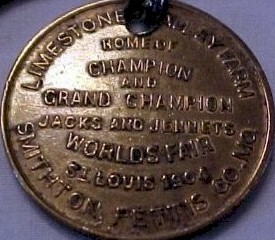 In 1903, he was first in class and champion at the Missouri State Fair. In 1904 at the great St. Louis World' Fair, he won first in class for best jack four years and older, first at head of herd for jack and four jennets; so also won senior champion and grand champion over all ages, winning a total of $1,500 besides several diplomas and medals. Orphan boy 696 is without a question one of the greatest breeding jacks living... He can show more colts with 34 - 35-inch ears from tip to tip than any jack I ever saw, and with size and individual quality in perfection. His colts all have plenty of vim, style and action. Orphan Boy 696 was bred by Col. W. P. Hayes, Bloomfield, Kentucky... He is a Black Jack, white, or nearly white points; 15 3/4 hands high and in fair flesh weighs 1,100 pounds. Orphan Boy's sire was Mark by Tarkington's Napoleon. His dam was W. B. Cecil's jennet by Giant. 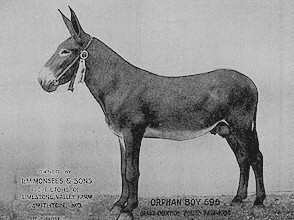 Orphan Boy was not only well-known among jack and mule breeders, but he eventually became the logo for a tobacco company. Thanks to Louise Drescher for sharing this scan of one of her postcards. World’s Fair Bulletin; “Awards in the Live Stock Department.”, World’s Fair, St. Louis, October 1904. Limestone Valley ad shared by John Bush.